The Ulster Historical Foundation and the University of Ulster are offering another History and Genealogy Summer School this year. Delegates are assisted in their family history research by professional genealogists and receive guided tours of relevant archives and excursions to historical attractions. Meals are included and accommodation packages arranged for those that want them. As recently promised, MilitaryArchives.ie has today updated its 1922 Irish Army Census database to allow searching by name. This is the third and final part of the project to digitise and release this collection, which was gathered together on the night of Friday 13 November 1922 to provide the Free State Army command with information on how many men it had at its disposal, and where they were. Scanned copies of the Census have been searchable since November, but there was no automated facility to search by name from the 33,200+ personnel. With the name index now online, researchers are able to interrogate the returns using a forename and/or surname and be taken direct to the pages where they appear. As well as providing a location for an ancestor in 1922, the returns give name, home address and age, date and place of attestation, marital status, and name and address of next of kin, typically father, mother or wife. As an additional feature, researchers can generate results on a county-wide basis. The updated collection with its full search facility can be accessed here. Dublin City Library and Archives (DCL&A) have released the Electoral Roll for 1908 to their selection of free-to-view databases on DublinHeritage. You can go direct to the search facility here. Back in 1908, those who were eligible to vote in local government elections (minimum age 21 for men/30 for women) had to state their qualification for voting; the individual had to be either a rated occupier, a freeholder/leaseholder or a lodger. The information requested of lodgers is potentially the most interesting for family historians, and it isn't available in any other collection. Lodgers were required to provide their own name and address, and that of their landlord, together with a description of their lodgings (size of room/furnished/unfurnished). They also had to state the amount of rent they paid, including details of any services included, such as meals. The 1908 roll holds details on 46,055 registered voters. According to the 1901 census, the population of the city was 290,638. This release is the first of a distinct project being undertaken by DCL&A. It is completely separate from the long awaited release of the Registers of Electors collection 1937-1964. "The 1908 records represent the first tranche of a project to digitise collections connected to Centenary Commemorations," DCL&A Senior Archivist Ellen Murphy told Irish Genealogy News. "Later this year we will make available the Electoral Roll for 1913." Thanks to @NYCGenealogist (Joe Buggy). Presumably in response to Ireland's Family History Year announcement, the online government advice service for Northern Ireland has today issued a mini-guide to help those starting out on their genealogy research. It doesn't go into a lot of detail, but it's a handy list of first level online resources. You'll find it on NIDirect. The 2nd annual 2013 History Festival of Ireland will take place on 15 and 16 June at Duckett's Grove, Rainstown, Co Carlow. A full weekend of lectures, debates, exhibits and performances is promised, all set against the romantic ruins of this magnificent Gothic Revival castle. In keeping with the theme of 2013 and The Gathering, much of the focus of this year's festival will be on Ireland’s international relationships over centuries past, and the history of the Irish abroad. There’s still room for any overseas Irish historical interest groups to get involved, if you have an idea for a suitable presentation or performance. Contact the History Festival team via the event's Facebook page. Ireland's Family History Year in London. Tourism Ireland announced at WDYTYA?Live that 2013 is to be Ireland’s “Family History Year”. London was a suitable setting for the launch, with one in six British residents claiming an Irish grandparent. The promotion is a bid to encourage the diaspora, whether in the UK or elsewhere, to find out more about their Irish ancestry. It's an initiative within an initiative; The Gathering has already done a lot of the leg work and there is a full schedule of clan gatherings, genealogy and local history events planned for the year. On the fun side are the International Gathering of the O'Neill Clans in Dungannon, Co Tyrone, which will recreate the crowning of the King of Ulster; the Gallagher Clan Gathering, which will attempt to break the world record by assembling 5,000 Gallaghers in one place in Co Donegal; and the 'It’s A Long Way to Tipperary Festival', with its unique International Churn Dairy Maids Races! In pure genealogy terms, the Family History Year will be kick-started next month with the opening of the St Patrick's Festival Genealogy Centre in Dublin (more about this five-day event, masterminded by Eneclann/FindMyPast.ie, in a post last week). Mark Henry, Tourism Ireland’s central marketing director, said of Ireland's Family History Year: 'The programme of clan gatherings and local history talks will continue right through to October, when Ireland’s largest genealogy event, Back to our Past, takes place. A dedicated Facebook page has also been launched by Tourism Ireland, as an accessible place for people to share stories and learn more about their Irish roots. The page will keep people updated on the special events that are happening as part of Ireland’s “Family History Year”. It already has nearly 10,000 'Likes', which is pretty impressive! Title: DNA - Brick Wall Buster?, with Dr Maurice Gleeson. Many people researching their Irish family trees will hit a Brick Wall around 1800. The paucity of records beyond this point make it difficult to know where to turn next. However, the advent of DNA testing has created the possibility of connecting with our genetic cousins and working together to break through those Brick Walls. Dr Maurice Gleeson will describe the different types of DNA tests (Y-DNA, mitochondrial DNA, and autosomal DNA) and gives practical examples of how each can be applied to help us in our own family tree research. The particular challenges and opportunities in relation to Irish genealogy will be highlighted, including an exciting new project which aims to reconnect the descendants of Irish slaves sent to the Caribbean in the 1600's with their distant relatives living in Ireland today. 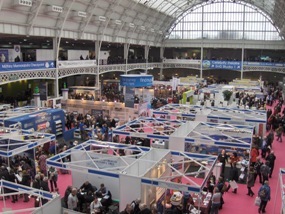 WDYTYA?Live got off to a lively start today at Olympia in London with the vast National Hall buzzing within minutes of the doors opening. Thousands of family historians were soon seeking answers and direction to further their research, and they were certainly spoiled for choice about how and from whom they acquired that advice, with hundreds of exhibitors on standby and a surfeit of lecture strands running throughout the day in locations across the ground and gallery floors. Now, I'm not going to write an all encompassing summary of the 'World's Largest Family History Show' – I'll leave that task to the dozens of other bloggers who were there – and there is, obviously, a very British bias to the exhibition. Instead, I'll stick to reporting the exhibition from an Irish genealogy perspective. I'll get rid of the negatives first. There were a much reduced Ireland presence this year, largely due to a lack of state funds, or, perhaps, to a lack of state vision. In the year of the Gathering, I'd call this response both confused and stupid; penny-pinching in these circumstances borders on scandalous, in my opinion. So those left carrying the Irish flag were huddled together in a minor strip beneath the big shamrock of Tourism Ireland, where Ireland's Family History Year was being launched. The reduced numbers meant that those seeking help with finding their Irish ancestors had fewer options; it also meant that the dedicated Irish exhibitors were soon thronged. I was helping out on the stand of the Irish Genealogical Research Society and was shocked by the number of people who were soon queuing up for help. It was like working behind the bar on a Friday night in a Cork city centre pub, only the clientele was much more polite and patient! Adjacent to us were PRONI and the Northern Ireland Family History Society, and I could see they were equally overwhelmed! The story that 'A fire burned all the records' is still alive and well in the UK, although I'd say that the term 'all' may have been replaced with 'a lot of' in the last year or so. Many visitors to the stand knew of the famous fire but a good number were asking IF the records they were after might have been among those lost. In other words, the notion of 'all' seems to have stepped down a notch to 'most' or 'some'. Hey, it's progress, and shows that the message the Irish genealogy industry has been repeating ad nauseum for many years may actually be reaching the audience. Hurrah! In addition to steering folk in the direction of appropriate records, collections, archives and databases, the IGRS was advising visitors that its new website – watch this space for news of its imminent launch – will not only be carrying unique collections within its members-only area, but will arrive in cyberspace with some terrific new research material in its free to access public area. I'm not at liberty to say exactly what these records are yet, but I'll mention '1871 census fragment' and 'pre-19th century marriages' to get you warmed up. I can assure you, they won't disappoint! You'll hear the full story here within the next month. Over at the Northern Ireland Family History Society, there was a copy of a new publication 'Researching Your Ancestors in County Monaghan' on display. This was so hot off the press, it isn't even on the NIFHS website, yet! A neat booklet, it costs £5 plus postage, and is to be the first in a series of publications covering each of the nine historical counties of Ulster. The NIFHS is, of course, still reeling from the sad and sudden death of its President, Randall Gill, last year. It's a credit to him, and to the Society's officers, that the Society is still moving forward. Maeve Rogan is the enthusiastic force behind the Newtownabbey branch's brand-new Facebook presence (here), and Rosemary Sibbert and Ann Robinson were able to rattle off a series of events they'll be involved over the next few months. I'll be reporting on the latter as the months roll along, but for now I'll just mention that the NIFHS plans to be part of the St Patrick's Festival Genealogy Centre in Dublin next month. I've already reported on this event (see blogpost) and will, no doubt, have more to say about it as the dates approaches. It's the brain-child of Eneclann/FindMyPast.ie and will be a major genealogy event within the Gathering calendar. Before heading south, though, I stopped by at the PRONI stand where some more good news was in store. The Valuation Revision Books are going to be launched online on the PRONI website at the end of March! These cover the year 1864 to 1930. Janet Hancock told me that they're 'geographically indexed', meaning that they will be searchable by townland/parish rather than by name. Superb news for anyone with ancestors from Northern Ireland. PRONI operates a 'one big upgrade/release a year' programme and the Valuation Revision Books will be this year's pleasure parcel. In the wings for 2014 is a big upgrade to the Wills collection. More about that later in the year. A team of genealogists from Ancestor Network (who, together with Eneclann, run the Genealogy Service at the National Archives of Ireland) was kept busy today on the stand they're sharing with Jim Ryan's Flyleaf Press. The latter publishing business has certainly upped the pace in the past year, with a spate of new books appearing in the 'Tracing Your Ancestors in County ....' series. Since the last WDYTYA, the catalogue has grown with Westmeath, Sligo and, only two weeks ago, County Clare. The latter was co-authored by Gerry Kennedy, chairman of Clare Roots Society, who was also attending the show today. During the course of this year we can look forward to brand new or re-editions of books covering counties Tipperary, Cavan, Wexford and Kildare. Looking forward, Jim says he'd like to extend the series further into the north of the island. He'd also like to find an author for County Leitrim, in order to round out the Western seaboard titles. 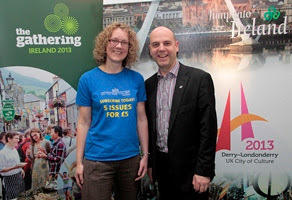 I also had a chat with Fiona Fitzsimons on the Eneclann stand. She told me that the process begun last year of digitising books and other documents in the Eneclann catalogue is going to continue. 'Digitised copies are what people want, so we'll be proceeding with the digitisation of the entire back catalogue', she said. 'It makes sense. It's easier for researchers to search a digitised collection and, with no postage costs, it's cheaper to buy.' You can see the latest conversions here. Although not a dedicated Irish site, I dropped by Rootschat.com. I've known this forum for several years, and always found the guys and gals in the Ireland sections very helpful. Unlike so many 'online communities', where 'latest posts' hark back months if not to years long gone, Rootschat isn't stagnant. It's lively and fast flowing, and it's members are quick to jump in with advice. This was the site owners first WDYTYA?Live, and Sarah Davies was keen to tell me about some of the technological improvements that have been made in recent months. Put into my non-technie language, it seems the site is less likely to crash, is generally more stable, and now has an enhanced Search facility. It's also been smartened up, with a more attractive interface. It's one of only two forums that I bother with personally, so I'm happy to recommend it. I'd hoped to have a chat with the Ancestry team that worked on the Lord Morpeth Roll project, but there was no getting through the crowds and the queues on their various stands. Fortunately, we already know the records will be released next month, so I don't know they'd have anything else to say at this point in time. And that was it for me at the show. I know I missed people I should have dropped by on, but the day whizzed by, and then it is done. I didn't get to one single lecture. I didn't get to eat anything, save one half biscuit, and when I grabbed a glass of orange at 2pm, I swear steam came out of my ears. That's what it's like. You get caught up in the whirl. And for a while you don't hear that your back is complaining or your voice has gone hoarse. You just know that this is a great occasion. And while it's terrific that it delivered some great news of records and resources coming our way, it's also true that Ireland deserved a greater presence. Some interesting events coming up next week! Continuing to 15 March: Exploring your roots, a family history exhibition. Free access during normal PRONI opening hours. Venue: PRONI, Titanic Boulevard, Belfast. Monday 25 February: The Clothmakers who fashioned America, with Bruce Clark. Host: Stewartstown & District Local History Society. Venue: Crieve Centre, The Square, Stewartstown, Co Tyrone. 8pm. All welcome. Monday 25 February: Family History Workshop for beginners. Newcastle Library. Newcastle, Co Down. Free. 11:00am-12:30pm and 2:00pm-3:30pm. Booking essential: 028 4372 2710. Tuesday 26 February: The West Clare Railway, with Jackie Whelan. Kilrush & District Historical Society. Venue: Teach Ceoil, Grace Street, Kilrush, Co Clare. 7:30pm. €5 for non members. Tuesday 26 February: Britishness and Irishness: shared or separate? A panel discussion looks at relations 15 years after the Good Friday Agreement and examines how we deal with our divided past, whether do national identities matter, and what role the Irish in Britain play. 7:30pm. London Irish Centre, 50-52 Camden Square, London NW1 9XB. Wednesday 27 February: Obituaries in Irish provincial newspapers 1860-1900. A Bibliofiles lecture at the National Library of Ireland, Kildare Street, Dublin2. Lecture with Dr Clara Breathnach, University of Limerick. All welcome. No booking necessary. Wednesday 27 February: Family History Workshop for beginners. Tullycarnet Library, Kinross Avenue, Kings Road, Belfast. 11:30am-1:00pm. Free. Booking advised. 028 904 85079. Thursday 28 February: The Poor Law and Public Health, with Olwyn Purdue. Part of the PRONI/OU lecture series entitled Urban History. Venue: PRONI, Titanic Quarter, Belfast. 6.30pm. Free. Thursday 28 February: An introduction to heraldry, with Seamus Bellew. Dunleer & District Historical Society. Venue: Dunleer Parish Hall, Co Louth. 8pm.Enquiries. Friday 1 March: From Rocky Shores to the Rocky Mountains: The Irish in Montana. Exhibition at Mansfield Library, University of Montana, Missoula, USA. Friday 1 March: Women, Internment, and the Irish Civil War, with Dr Ann Matthews. Part of the NUI Maynooth History Forum programme. 8pm. Rhetoric House, South Campus, NUI Maynooth, Co Kildare. Enquiries. To coincide with WDYTYA?Live, GenesReunited is offering a 15% discount on annual subscriptions to its Standard and Platinum packages. The offer is restricted to UK-based researchers. The site, which says its tally of family history records totals 580 million, is particularly strong on English and Welsh records and on putting researchers in touch with others who are studying the same tree. I've located at least half a dozen distant (and not-so-distant) cousins through it, and in some cases those cousins have been able to provide information that I'd never have located through documentary sources. To take advantage of the discount, use this code: WDYTYA13. The offer runs from 22 to 28 February. Offaly Local Development Company and Ireland Reaching Out have invited tenders for the delivery of a programme of lectures and workshop training. Introduction to development of projects including family history, town land and place name mapping, historical map reading and matching to records etc. There's no time for delaying! The deadline for receipt of proposals is 28 February and the training is to start in Birr in mid-March (followed by further venues in April-June). Since we're now into the short but manic WDYTYA?Live season, stand by for a great selection of special deals on subscriptions and purchases of all types. First up is Find My Past Ireland where you can grab a 15% discount on two database subscription packages. So whether you want a Britain & Ireland sub or a Worldwide sub, you can make a healthy saving. This package brings you unlimited access to family history records from UK and Ireland, including unlimited access to to 55million historical British newspaper articles. Details. This subscription gives you unlimited access to family history records from USA, Australia, New Zealand, UK and Ireland, plus unlimited access 55 million historical British newspaper articles. Details. Find My Past UK has released the first tranche of a collections of records dealing with crime, prisons and punishment. It's the first time they've been online, and they cover the period 1817-1931. The original records are held by The National Archives in Kew, London, and FindMyPast has spent the last two years scanning and transcribing them. They contain the kind of information that isn't usually found in other records, and can give you a real idea of what your ancestor was like. Even more, many of the records include photos: the mugshot! Additional records, covering 1770-1934, will be added in the coming months to make up a total collection of 2.5million records. Patrick Driscoll, born 1813, was convicted in 1830 at Bristol Court, of 'Breaking open a dwelling house and stealing £16 2shillings.' He was sentenced to 14 years. The Gaoler's Report says this was not his first term in prison and describes his 'character, disposition, connections and former life' as 'very bad'. UPDATE 11.30am: This collection seems to have caught the imagination of family historians, and that enthusiasm has overwhelmed the site this morning. I tried for a couple of hours before getting the above successful search return. Even then, the image was slow to download. Probably as well to 'come back later'. As part of this year's St Patrick's Festival, an Irish Family History Centre is to be created at the Discover Ireland Centre, Suffolk Street, Dublin 2. It will operate from Thursday 14 March to Monday 18 March inclusive (opening times below) and is free. Organised by FindMyPast.ie and Eneclann, the event is aimed primarily at beginners and tourists (and there will be a good few of the latter around that week!). They will be able to take advantage of free advice and free FMP.ie access on multiple PCs. Family history groups, including the Irish Genealogical Research Society, will also be on hand to help visitors get started on their research or overcome a brickwall. Lectures are also being planned. The final report of the Laois Graveyards Survey has been published. The survey, which included all the graveyards in the county, was carried out by Barker and Associates Archaeological Consultants in 2011 and all the findings – details of any memorial and oral history recordings – are now available for free viewing on the Historic Graves website. Volume I contains details of the aims, methods and results of the survey and broad conclusions and recommendations. Volume II (below) is a detailed gazetteer of all sites surveyed. You can download it here (it's a 7.3mb pdf). The formal launch of the survey will take place on Wednesday 27 February at 8pm at Killeen Community Centre, Maganey, Co Kildare. Laois County Council commissioned the graveyard survey project, which was funded with the support of the Heritage Council. 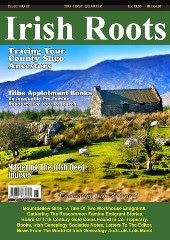 The Spring issue of Irish Roots magazine has been published and is now available in all Easons stores in Ireland and in Barnes & Noble stores in the USA. This issue contains features on tracing ancestors in County Sligo, getting best research value from Tithe Applotment Books and the Irish Deed Indexes, and an analysis of Lord Morpeth's Testimentory Roll, which is due for release, free of charge, next month. Among other articles there are features looking at emigration, social issues, Australasian research, and recent discoveries of historical relevance. My own What's New? Review ensures readers are kept fully up to date with all resource releases and developments since the previous quarter and you can also find out what all the major Irish genealogy research societies have been up to and where they're going. So there's plenty of expert advice within the covers and you can choose how to read it, too! Buy the hard copy in store or let it land on your doormat via a postal subscription, or read a digital copy online. Click the image above to find out more. Ireland Genealogy Projects Archives have issued their latest update covering items added in the first two weeks of February. Cancelled Books (Valuations) from Miltown Malbay E.D. Filming for RTÉ's The Genealogy Roadshow will take place in the Lumen Christi College, Derry, on Saturday, 23 March. 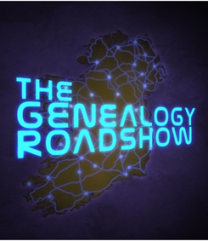 As well as filming these elements of the show, the Roadshow team will be in the College all afternoon eagerly helping people find extraordinary stories in their family, as well as giving free advice on how to track down a family history. Admission is free and all are welcome, but you need to confirm your intention to attend in advance. There will be two sessions of filming – at 12.30pm and again at 2.30pm – and you can come along for the whole event or the time of your choice. Call Ciara (from Derry) on 028/048 + 308 34046, or email. FindMyPast Ireland has released a new record set comprising of gravestone inscriptions for nearly 41,500 individuals, most of them dating from between 1618 to 2005. In each case, the full memorial inscription is included, so there are often details of other family members recorded. So, too, in some cases, are the cause of death and the profession of the deceased. The areas covered by this data set are the counties of Cavan, Donegal, Fermanagh, Leitrim, Meath, Monaghan, Tyrone and Achill Island. This record set was compiled by Eileen Hewson who dedicates much of her time to transcribing the details on memorials in Ireland, India and Sri Lanka, and is the founder of Kabristan Archives. PRONI is to host ‘Exploring Your Roots’, a family history exhibition on temporary loan from Mid-Antrim Museums Service. It opens on Monday and will run until Friday 15 March. A launch event will be held on Tuesday 19 February from 1-2pm and PRONI is extending an invitation to the public to attend. The exhibition will be formally welcomed with an hour of short talks, including an introduction to the exhibition from Jayne Clarke of Mid-Antrim Museums Service and Dr. William Roulston, Ulster Historical Foundation. This will be followed by an introduction to family history sources at PRONI by Dr. Glynn Kelso of PRONI. Exploring Your Roots looks at the unique resources available for those seeking to find out more about their family history, both in museums and at PRONI. Rate books, burial records and business ledgers can contain useful information such as the names of those who owned land or worked in a particular industry. Family photographs, often contained in faded albums, capture a moment in time. These images can be explored to show how people lived and worked in earlier times. Photographs, maps, documents and artefacts held by museums help to place our ancestors in their day-to-day world. While it is exciting to discover the name of an ancestor in museum records, it can be equally interesting just to explore the world in which people lived in the past. The exhibition was designed to offer a flavour of the diverse collections held within the Mid-Antrim Museums Service and to offer people a source of reference or context for the items they may find at home. If you would like to join PRONI at the launch, please telephone Tel: (+44) 028 90 534800 or email to secure your place. Belfast City Council is to host a series of events to mark the rise of the women`s suffrage movement a century ago. The programme starts next week and continues to the end of March. Wednesday 20 March: A reading from Lay Up Your Ends, by Martin Lynch – set against the backdrop of the 1911 mill girls` strike, and following the lives of five workers at the York Street mill at the time. On International Women`s Day – Friday 8 March – a rally will leave the University of Ulster`s Belfast campus at 12.30pm, to march to the City Hall, where it will be welcomed by the Lord Mayor, Alderman Gavin Robinson. In keeping with the theme of `commemoration and celebration`, some of the women taking part in the rally will be dressed as suffragettes. Another highlight of the events programme will be a series of `HERitage Tours`, which will take in many of the landmarks associated not only with the suffragette movement but also women`s contribution to the political and community life of Belfast throughout the intervening years. The tours will highlight the `millies` and the struggles of women in the linen mills and weaving factories and the women imprisoned in Crumlin Road gaol because of their fight for the right to vote, as well educational pioneers, anti-slavery campaigners, trade union and political activists, singers, writers and community workers. For details of these free tours, contact Women`s Tec on 9074 9810. The Ulster Hall will also be staging a series of special events over the period, including themed book groups, screenings of classic movies, and a showcase of music, theatre and poetry by Belfast women singers on writers. Details. This being Valentine's Day (don't tell me you haven't noticed! ), I feel obliged to make some kind of reference to love and romance. Fortunately, FindMyPast Ireland have made light work – for me – of finding that reference. They've posted a nice feature about Irish love tokens. Read it here. The thought of men making those harvest knots is incredible. But men can be incredibly romantic. Back in the day, my husband carved me a tiny pot from a dark African wood; it's a bit like an egg-cup with a lid, but elegant and very very delicate. That was about 10 years before we married and I knew from the work and precision he had put into it that this fella was for keeps. I guess this proves, as if proof were needed, that love tokens work. The little pot is now the home of my wedding ring. The major databases have been refreshing their sites over the last week with a few updates worth mentioning. I'll start with Ancestry. It says it has upgraded its Irish Civil Registration Marriage Index database but, as is its way, gives no indication of what that upgrade involved. I'd hoped it might bring the Marriage Search up to the same standard as FindMyPast's Marriage Finder (which can filter out marriage records that don't contain both the spouses you've named). But it doesn't seem to have done so. I've just made a test search for my great grandparents' wedding, using only their surnames: Santry and Driscoll. These are South West Cork names and as a marriage combo they appear only a dozen times in the civil registration indexes so the Ancestry search engine should, if the marriage filter is working, find no more examples than that. Instead, the Ancestry search engine returned a long list of Santry marriages, but there are no Driscolls mentioned in the 'spouses' lists of the first couple of names. Only when I added the year of the wedding – 1877 – did it get close. And still not very close. My gt grandparents' wedding record came third in the search return list. Neither of the marriages in first and second place had a Driscoll mentioned in the record. So if the upgrade wasn't about the marriage filter, your guess is as good as mine about what it's been about. More clear-cut is Ancestry's upload of a ton and a half of parish registers from the Church of England Diocese of Manchester. The area covered by the diocese included Manchester, Salford, Bolton, Rochdale, Stretford and Trafford, Ashton-under-Lyne, Oldham, Leigh and Rossendale. The city of Manchester itself had long been an important trading centre, and many of these outlying areas had developed strong manufacturing and industrial bases. As this part of southeast Lancashire is not a great distance from Liverpool and other Lancashire ports, many Irish flocked to the area in search of employment. *The number of marriages in this record set is small and they date from 1754 to 1812. Use the "Any Event" and "Keyword" fields to search the marriages in this particular record set. The collection is searchable in the regular way, but it is also possible to browse images of the registers by parish. Click here for the Manchester collection. Ancestry also has a huge Lancashire and Liverpool collection. The latter has just been updated (no idea in what way) and both are worth checking if you have family from this region. Over at FamilySearch, the England & Wales census of 1871 is coming along well. New record additions mean this collection is now 81% complete and holds 5,617,114 names. There's also been an upgrade of new images to the England, Northumberland, Miscellaneous Records, 1570-2005 collection. This is a browse images only record set of Parish Registers, Electoral Registers, Non comformist Records, and Parish Chest. The 225,967 images now available come from towns and parishes throughout Northumberland. They're broken down into Cumberland, Durham and Northumberland. FindMyPast has also seen a couple of new additions. The first is a collection of some 208 newspaper titles accessed from the British Newspaper Archives. Some 9,000 Irish Soldiers Wills have been added to the same FindMyPast packages, too. This collection is also available free of charge at the National Archives of Ireland's genealogy site. A partial reconstruction of the vestry records of St Audeon's, Cornmarket, Dublin 2, was launched in that church on Monday evening and provides valuable insights into the life of the parish and the city of Dublin in the 17th century. While the parish registers from the late 17th century have survived, the vestry minutes have not; they may have been lost in the 1922 fire. 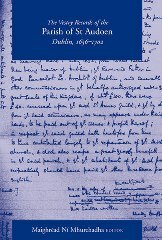 The newly published book – The Vestry Records of the Parish of St Audoen, Dublin, 1636–1702, edited by Dr Maighréad Ní Mhurchadha – is based largely on printed extracts from the originals which were published in the Irish Builder and previously unpublished transcripts in Marsh’s Library made by the Revd Christopher McCready. At the launch, Professor Raymond Gillespie of the History Department of NUI Maynooth, said the book was important because it cast a light on what was a central moment in the emergence of the parish system. He said St Audoen’s was a unique parish as it was attached to the Roman Catholic Guild of St Anne. He added that the church lies at the centre of the early modern city. “They are not simply the records of a church, they are not simply the records of a denomination, but they are the records of the life of a city,” he stated. 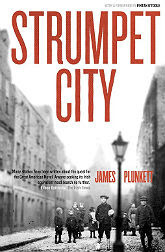 The hardback book costs €55 (€49.50 if purchased online) and is available from the publishers, Four Courts Press. A conference called Exodus: Movement of the People, which will study migration to, from, and within the geographical British Isles, is to be held from 6-8 September. Organised by the Halsted Trust and sponsored by FindMyPast UK, the event will give the genealogy community an opportunity to increase their knowledge of migration and the records available as well as to network with other family historians. The programme is eclectic; I think most delegates will find it difficult to choose between the workshop options where two are run simultaneously. And there are two specifically Irish focussed workshops. Venue: Hinckley Island Hotel in Leicestershire. Costs: See booking form for details. There's a residential package available as well as day delegate rates. Early bird discounts are held until the end of May. The conference website at www.exodus2013.co.uk also has many stories of migration. The School of Histories and Humanities at Trinity College Dublin and Glasnevin Trust, which operates Glasnevin Cemetery, have formed a partnership to further public and academic understanding of the historic events between 1912 and 1923 that helped shape modern day Ireland. This pivotal decade has become known as the Decade of Centenary Commemorations and includes great historic events such as the Great 1913 Lockout, the First World War, the Easter Rising and War of Independence. Combining the deep academic expertise and resources of Trinity College’s School of Histories and Humanities with Glasnevin Cemetery’s over one million digitised burial records and public commemorative events, the partners will research, explore and share new perspectives and information about the era for new generations to learn from. In addition to offering training support, academic guidance and bursaries will result in a public lecture series in Glasnevin Cemetery’s Museum. The programme will be designed by the Trinity School of Histories and Humanities and will be timed to coincide with particular centenaries during the Decade of Commemorations. John Green, the Chairman of Glasnevin Trust, commented: ”I believe this unique partnership between Ireland’s most prestigious University and most famous cemetery will bring fresh insights to what was a momentous decade for this island. Ireland's Local and Regional Museums Scheme has received a welcome boost in funding from €57,000 to €300,000. The scheme is designed to support small and medium museums across Ireland. Projects funded have to make a contribution to the development and promotion of Ireland's cultural tourism offering, to the benefit of both the domestic and foreign tourist. They should also encourage the use of local and regional museums by a larger segment of society.. Projects which benefitted from the scheme last year include the Allihies Copper Museum, the Irish Jewish Museum, Rothe House and Garden, the Dundalk County Museum and the Waterford Museum of Treasures. Successful projects included the translation of audio tours, the hosting of specific exhibitions, and the extension of opening hours. Making the announcement of the new level of funding, Jimmy Deenihan TD, Minister for Arts, Heritage and the Gaeltacht, said: "Museums make a huge contribution to local communities, to tourism, to historical groups, and to our understanding of who we are and where we have come from. The network of small and medium museums that are found across the country are a rich repository of local knowledge, and guide us in understanding different strands of our political, social and economic history. Applications for funding under the 2013 Scheme are invited from local and regional museums and/or organisations and institutions that operate as not for profit institutions whose primary role is to collect, safeguard, hold in trust, research, develop and interpret collections of original objects and original objects on loan, for the public benefit. The closing date for applications is 28 March 2013. Details. PRONI had to postpone Karen McCarthy's book reading and talk last week, but it's now been re-scheduled for Monday 25 February. Karen will be introducing her book, The Other Irish: The Scots-Irish Rascals who Made America, telling the story of the thousands of emigrants with grand dreams who sailed from Ireland's northern harbours at the end of the 1700s and tamed the American South. There will be an opportunity to buy Karen's book and to have it signed by the author. The event will take place at PRONI, Titanic Boulevard, Belfast, from 1pm to 2pm. While it is free to attend, you should book by email, or telephone (+44) 028 90 534800. The second series of The Genealogy Roadshow will begin filming at Powerscourt House & Gardens, Co Wicklow on Saturday 2 March. The RTÉ Television production's history and genealogy experts – Turtle Bunbury, Susan Chadwick APGI and John Grenham APGI – will be on hand to help the public identify and unravel the extraordinary stories of their ancestors. They'll also be offering free advice about how to carry out family history research. Admission is free and all are welcome to come along, but please let the production team know in advance that you intend to attend. There will be two filming sessions – at 12.30pm and again at 2.30pm – but you can come along at any time that suits you, or stay for the whole event. To take up the invitation, phone Ciara on 0044 28 30834046 or email. There's plenty to see and plenty to learn in the next couple of weeks, as you can see from the calendar of history and genealogy related events below. Must mean Spring isn't too far away! Saturday 9 February to Sunday 24 February: Vanishing Ireland, an exhibition of photos featured in the book series of the same name, by Turtle Bunbury and photographer James Fennell. Burtown House and Gardens, Athy, co Kildare. Saturday 9 February: Drop-in Genealogy session, with Mayo Genealogy Group at the National Museum of Ireland, Turlough Park, Castlebar, Co Mayo. 11am–1pm. Free. No booking required. Monday 11 February: Family History Workshop for beginners. Newcastle Library. Newcastle, Co Down. Free. 11:00am-12:30pm and 2:00pm-3:30pm. Booking essential. 028 4372 2710. Tuesday 12 February: The Talty Millions: A genealogical journey from Miltown to Miami, with Paddy Waldron. Host: Old Kilfarboy Society. Venue: The Malbay, The Square, Miltown Malbay, Co. Clare. 8pm. Thursday 13 February: Edward Brice and the Origins of Irish Presbyterianism, with Rev Dr John Nelson. Host: Presbyterian Historical Society. Venue: Ballycarry Old Presbyterian Church, Ballycarry, Co Antrim. 8pm. Thursday 13 February: Researching Your Irish Heritage in New York City, with genealogist Joe Buggy. Host: Irish Cultural Society. Venue: Garden City Public Library, 60 Seventh Street, Garden City, NY 11530, USA. 7:30pm. Free. All welcome. Saturday 16 February: The Royal Irish Fusiliers at Gallipoli - Memoirs of John David Purcell, with Margaret Purcell, Venue: Talbot Library, Weston St., Preston, UK. Host: The North West Region of the Catholic Family History Society. Saturday 16 February: The History of Creevelea Abbey, with Fr Liam Kelly. Host: Carrick Historical Society. Venue: St Joseph's Community Centre, Leitrim Village. 8:30pm. Monday February 18 to March 15: Exploring your roots, a family history exhibition. Venue: PRONI. Free and accessible during normal PRONI opening hours. Titanic Boulevard, Belfast. Monday 18 February: Distilling in the East Midlands, with Pat Given. Offaly Historical & Archaeological Society. Venue: Bury Quay, Tullamore, Co. Offaly (beside Tullamore Dew Visitors Centre). All are welcome. Entrance €2 to members and €5 to non members. Enquiries. Monday 18 February: Reading graveyard inscriptions, with Michael Tierney. Birr Historical Society. Venue: Dooly's Hotel, Birr, Co Offaly. 8pm. All welcome. Thursday 21 February: Common Myths about Your Immigrant Ancestor – And How to Find out the Truth, with Lisa Walsh Dougherty. A genealogy workshop at the Irish American Heritage Museum, 370 Broadway, Albany, NY, USA. 6:30pm. Thursday 21 February: The Home Rule Crisis 1911, with Bessbrook Heritage Group. Venue: Bessbrook Library, Bessbrook, Co Armagh. Free. 7:30pm. Booking advised: 028 308 0424. Friday 22 February to Sunday 24 February: WDYTYA?Live at Olympia, London. Mega genealogy fest. Website. Saturday 23 February: British Isles Immigration through Castle Garden 1820-1892, with Carol Darrow. WISE FHS Denver, Colorado. Download pdf for details. The Indiana Historical Society (IHS) and Genealogical Society of Marion County (GSMC) are holding a day seminar on Irish and Scots-Irish genealogical research on Saturday 23 March. Featured speakers are Fintan Mullan, Director of The Ulster Historical Foundation, and Brian Trainor, former Director of Northern Ireland’s Public Records Office. For full details, download the programme. Venue: Basile Theater, The Eugene and Marilyn Glick Indiana History Center (home of IHS and its Indiana Experience), 450 W. Ohio St, Indianapolis. Costs: $35 ($28 for IHS and GSMC members); Lunch option: Potato Bar $12. Registration includes admission to the Indiana Experience on the day of the seminar. 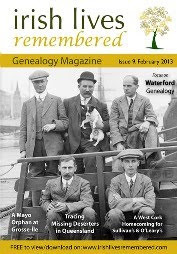 The February issue of Irish Lives Remembered has been issued and is available for free download by clicking the image. Waterford is the focus of this month's issue. With 28 pages dedicated to the county, there's in-depth coverage of the holdings of both the City and County Archives (they're very different, although there is some common ground) and an interesting piece on the history of Waterford surnames. Other features include a piece by well-known historian and photographic detective Jayne Shrimpton about Victorian fashion photography, and a four-page article by Michael Merriman setting out context for Ireland's national and international famine commemmorations. Shauna Hicks tells about Irish deserters in Australia and there are personal family stories of ancestors from Sligo, Armagh and Mayo. A preview of WDYTYA?Live gives a good account of what visitors can expect at this month's family history extravaganza in London. It does, however, make one error. The Northern Ireland Family History Society will not be the only Irish society exhibiting. The Irish Genealogical Research Society will also be in attendance – on Stand 443 – with several members ready and willing to help researchers with their queries, whether they're trying to climb over a brick wall or simply don't know where or how to start their Irish research. The Genealogical Society of Victoria will be running a four-session Beginning Irish Family History course on Tuesday mornings from 12 February. The sessions will be held 10:30am to 12:30pm in the Meeting Room at the Genealogy Society of Victoria, Level B1 257 Collins Street, Melbourne, Australia. Costs: GSV members $64.00; non-members $128.00 Bookings. The Irish Cultural Center in Phoenix Arizona is giving family historians two opportunities to attend an Irish Genealogy Seminar in March. Both events are the same; delegates can choose which day they prefer: Sunday 17 March or Monday 18 March. Lectures will be presented by Fintan Mullan, Executive Director of the Ulster Historical Foundation (Belfast) and Dr. Brian Trainor, former UHF Director and Chief Executive of the Public Records Office of Northern Ireland and former chairman of the Irish Manuscripts Commission. Registration Fee: $30 for Irish Cultural Center members, or $35 for non-members; Lunch (optional) $10: Sandwich, chips, drinks. Deadline for registration: 11 March 2013, or first 100 people for each seminar. To book or for more details: Tel: 602 864-2351 or see website. 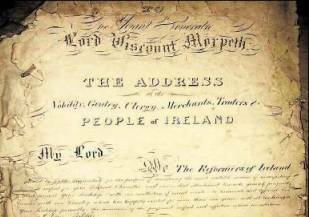 Ancestry has quietly added a wee note under the Upcoming Collections heading on its website to announce the launch of Lord Morpeth's Roll on the database in March. Curiously, the announcement says that the parchment contained 'the names, and sometimes addresses, for about 157,000 Irish citizens', which is about 120,000 less than was expected. No doubt we will discover the truth when it is released. The project to digitise the document is one of Ancestry's World Archives Projects so it will be made available with free access. I was half expecting the launch to coincide with WDYTYA?Live and all the publicity that goes with it, but I'd now bet my hat that it'll be St Patrick's Weekend. Along with loads of others, I can't wait for this release. 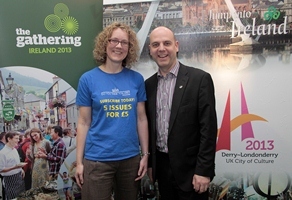 Plans to create a regional archive centre in Derry-Londonderry, complete with an accessible home for the city's genealogical collections, have come a step closer following the award of a development grant of £278,000 from the Heritage Lottery Fund (HLF). This grant means the project has received a 'first round pass' and can use the award to work up more detailed plans in order to secure the full £3million grant needed. The ambitious project will create a new visitor attraction on the city's Waterside by conserving two listed buildings within the former military site of Ebrington for use as the Maritime Museum and Archive Centre. It will bring to life the city's rich maritime heritage with the museum galleries tracing the history of the River Foyle, the development of the port and its impact on human and social heritage through exhibitions, interpretative materials and interactive elements. Inside the buildings, the Heritage and Museum Service's archive of some 30,000 items, which are currently largely inaccessible, will be opened to the general public. In particular, the proposed regional archive centre will provide access, display and interpretative space for the city's archive and genealogical collections, which are unique to Northern Ireland. Amongst the gems of the collection, which is the largest and most significant public archive held outside of the Public Records Office NI, are 18th- and 19th-century records related to emigration. Derry-Londonderry was, of course, the main port of emigration from the north of the island of Ireland at that time. Local people will be encouraged to become involved in the project with volunteers recruited and trained to help index the collections and carry out genealogical research. Training will also be provided in collections care, learning programmes and research skills. New education facilities such as a lecture theatre, meeting spaces and training rooms will create space for a range of formal and informal learning opportunities including guided tours, activity trails and audio tours. Further to last month's announcement that the 2013 National Famine Commemoration would be held in Kilrush, Co Clare (see story), the powers that be have finally put the event in their diaries: Sunday 12 May. The date was settled last week when both the National and International famine commemoration programmes were launched at the 'Famine' sculpture on the Custom House Quay. It is confirmed that President Michael D. Higgins will lead the official representation at the National event in Kilrush. The International Commemoration of the Great Irish Famine will take place in Sydney on Sunday, 25th August. A second Open Day has been announced for Drumclay Crannog in County Fermanagh, where archaeological excavation has produced many insights into life from the 7th to the 16th century in Ireland. The Crannog is an artificial island in a lake. Archaeologists have unearthed over 4,000 artefacts, the foundations of dozens of houses, and an extremely large round house, possibly 12m in diameter, which may be the largest house structure of the period ever to be discovered. Each layer has revealed even more about the past and these discoveries are reshaping national and international thinking on crannogs and the lives of people stretching back 1,300 years, at least. A first Open Day was held in December 2012 and was a huge success. More than 800 members of the public took part and saw first hand some of the most striking finds - including ancient combs, decorated dress pins and wooden tools. The Drumclay Crannog open day will comprise of a series of talks at the Fermanagh County Museum, followed by a guided tour of the archaeological site. Access to the site for this tour can only be obtained via an official coach at the Fermanagh County Museum at Enniskillen Castle Museums. Spaces are limited for both the talks at the Fermanagh County Museum and the guided tour of the site, so booking is essential on 028 6632 5000 (NI) or 048 6632 5000 (ROI). Flyleaf Press has published the latest in its 'Tracing your Ancestors' series, this time for those with roots in County Clare. This well-received series looks at the availability of family history records in the county and sets out where they can be accessed. Each book also looks at the history of each county, and how this has impacted the survival of record, as well as setting out the ideosyncracies of research in the area. County Clare was badly affected by the Great Famine during which so many died or emigrated; its huge diaspora will find this book extremely useful to their genealogy research. A Guide to Tracing your Clare Ancestors, by Brian Smith & Gerry Kennedy. Paperback of 160 pages with index and many black and white illustrations. A one-day workshop – Walking in the footsteps of your ancestors – will be held at the National Library of Ireland, Kildare Street, Dublin 2, on Friday 15 March. Starting at 10:15am and ending at 3:15pm, the one-day immersion course is aimed primarily at beginners and will be delivered by the Eneclann team. The morning session will cover civil registration records, the 1901 and 1911 Censuses, online sources and newspapers. The afternoon session will focus on Valuation Office records and customs and traditions around life events in 19th-century Ireland. Participants will be provided with take-home materials, including workshop presenters' notes, CD-ROMs, and a trial subscription to FindMyPast Ireland. The cost of the workshop is €45.00 (includes refreshments and lunch). Full details and bookings here. Some interesting events for historians and genealogists are taking place this week. Tuesday 5 February: The impact of the Plantation on the local landscape, with Heather Thompson. Host: Ballinascreen Historical Society. Venue: St Colm's High School, 8:00pm. Website. 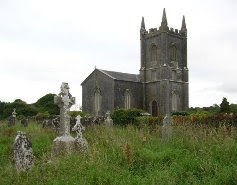 Tuesday 5 February: The 18th Century Headstones of Wicklow, with Chris Corlett. Host: Kilmacanogue History Society. Venue: The Glenview Hotel, Glen of the Downs, Co Wicklow. 8.30pm. All welcome. Entry €3 (€2 for members). Website. Tuesday 5 February: The lost settlement at Dunnalong, with Dr William Roulston. Host: Ulster Historical Foundation. Venue: St Augustine's Church, within Derry's Walls. 7:30pm. All welcome. Details: Hazel Philson on 02871 346408. Tuesday 5 February: Family History Online for Beginners. Killyleagh Library, High Street, Killyleagh, Co Down. 2-3:30pm. Booking: 028 4482 8407. Wednesday 6 February: HistoryIreland Hedge School – Genealogy: Who does it think it is? A roundtable debate with editor Tommy Graham in the chair. National Library of Ireland, Kildare Street, Dublin 2. 7pm. Free. 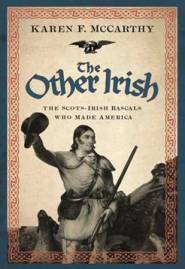 Wednesday 6 February: The Other Irish: The Scots-Irish Rascals who Made America with Karen McCarthy discussing her book. Venue: PRONI, Titanic Quarter, Belfast. Booking advised by email or tel: 44+ 028 90 534800. Time: 1-2pm. Free. UPDATE: This event has been postponed. A new date will be announced in due course. Wednesday 6 February: Piracy and Predation in early 17th century Ireland with Connie Kelleher. Part of the Below The Surface series of maritime stories on board the Jeanie Johnston, Custom House Quay, Dublin 1. Doors 7:15pm. Tickets €15, available from www.jeaniejohnston.ie. Thursday 7 February: Life as it was lived in days of war: accounts of the First World War held at PRONI, with Ian Montgomery. Venue: PRONI, Titanic Quarter, Belfast. 7pm. Free. No booking. Ireland Genealogy Projects Archives has issued its update for the second half of January. "In addition to adding headstones, we have moved into some other types of records," says IGP-Archives co-ordinator Christine. "We have been transcribing Cancelled Books (valuations) for the Electoral District of Miltown Malbay in Co Clare and we've also added more Memorials for various counties." Seapatrick Church Memorials & Tullymore Park, James Bligh JOCELYN, R.N. Church Records – Asst. Marriages from St Kevins CofI. Memorial Cards – Mary Begly Memorial Card.